New Zealands best bikini girls prices, if you find something better, let us know and we’ll work out something for you. Do you have a business event you want to promote, bar babes needed for your local, or you simply want someone attractive to be part of your stag party, serving drinks and having a laugh with the boys. For that perfect stag party, get that unforgettable explosive start to it with a bikini babe on the door, serving drinks. Believe us, we know that planning the perfect stag weekend is usually a last minute affair, we have some of the nicest girls on our books to make it happen. Book early and you’ll even get to pick who you want and if you want to up the game we even know a few that strip to give you even more fun on the night. We’ll be honest, we know a lot of bikini girls, if you get a quote from another New Zealand Owned Agency, or you’re shopping around, we’ll try to match any other ‘written’ offer with either the same talent, or better. Give us a call on 0211519266. We have Auckland's sexiest bikini hostesses/waitress's and party starts for your next Stag Do or boys weekend. Our hostesses are experienced for dealing with large stag groups, meeting and spoiling the stag. We have Auckland's sexiest bikini hostesses/waitress's and party starts for your next Stag Do or boys weekend. The girls serve drinks and nibbles, mix and mingle and generally entertain you. Our hostesses are experienced for dealing with stag parties of all shapes and sizes. They'll mix and mingle and greet your guests, hang out with the stag and bring some fun as part of your entertainment. 4 hours of 1 of our bikini girls, for your next stag party. Booking them longer for your next party bus, boat cruise or a boys day out, means they're involved with the party from start to finish. Great for entertaining, serving drinks, nibbles and mingling with your guests. 5 hours of 1 of our bikini girls, for your next stag party. Booking them longer for your next party bus, boat cruise or a boys day out, means they're involved with the party from start to finish. Great for entertaining, serving drinks, nibbles and mingling with your guests. A full hour of two of our Bikini Girls. We have New Zealands sexiest bikini hostesses / waitress's and party starts for your next Stag Do or boys weekend. Our hostesses are experienced for dealing with large stag groups, meeting and spoiling the stag on the day. 4 hours of 2 of our bikini girls, for your next stag party. Booking them longer for your next party bus, boat cruise or a boys day out, means they're involved with the party from start to finish. Great for entertaining, serving drinks, nibbles and mingling with your guests. 5 hours of 2 of our bikini girls, for your next stag party. Booking them longer for your next party bus, boat cruise or a boys day out, means they're involved with the party from start to finish. Great for entertaining, serving drinks, nibbles and mingling with your guests. We have Auckland's sexiest bikini hostesses/waitress's and party starts for your next Stag Do or boys weekend. Our hostesses are experienced for dealing with large stag groups, meeting and spoiling the stag with our hot blondes, redheads & brunettes. 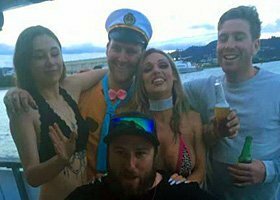 We have Auckland and New Zealands sexiest bikini hostesses/waitress's and party starts for your next Stag Do or boys weekend. The girls serve drinks and nibbles, mix and mingle and generally entertain you and your guests for two hours. 4 hours of 3 of our bikini girls, for your next stag party. Booking them longer for your next party bus, boat cruise or a boys day out, means they're involved with the party from start to finish. Great for entertaining, serving drinks, nibbles and mingling with your guests. 5 hours of 3 of our bikini girls, for your next stag party. Booking them longer for your next party bus, boat cruise or a boys day out, means they're involved with the party from start to finish. Great for entertaining, serving drinks, nibbles and mingling with your guests.